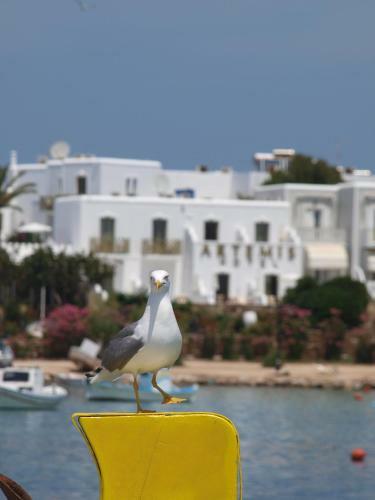 The name of Antiparos derives from the old-Greek descriptive term “Andi-Paros” – opposite Paros. This also applies to the situation the inhabitants of the Cycladic Island (there are about 1250 of them) find themselves in: somehow they have always been over-shadowed by their big brother Paros, only 1.5 kilometres (10 minutes by ferry) across the sea from little sister Antiparos. It is hardly surprising, considering the circumstances, that the people of Antiparos have always been proud of their independence of the neighbouring island. And it looks like this attitude has paid off, as the population of the pretty island has doubled since the 1960’s. Most islanders live in the harbour town and capital of the island, the Chora of Antiparos. In the 70’s Antiparos was popular with hippies and dropouts, and where today’s campsite is situated in the bay, people used to just unroll their sleeping bag somewhere in the shade. Those days are gone, a lot has changed on the island and a lot of building work has been done. Some of the new houses are complete with swimming-pool, although you are never far from the sea on the island. Some trendy luxury villas have also been built, one of them belongs to Tom Hanks, another one supposedly to Madonna. A few years ago, Russian billionaire Roman Abramovitch wanted to purchase the lovely plot of land where the campsite is for himself and his family. But the owners preferred to keep it and carried on running their campsite on the beach. Most of the locals on Antiparos live on tourism nowadays, running shops, restaurants or hotels. The peak season can be quite busy on Antiparos. Luckily the island’s feel of a remote little paradise has somehow survived all this. By the way, Antiparos was the first Cycladic Island with a public nudist beach, which increased its popularity with naturists enormously. Nowadays most beaches seem to tolerate people who forget to bring their swimwear. There are quite a few beautiful beaches on Antiparos, most of them sandy with intensely turquoise water. During the summer months, Antiparos is visited by posh luxury yachts, because their rich owners prefer the remote little island to the crowded resorts on Paros or Mykonos. In culinary terms, the Cycladic Island has a lot to offer as well: very tasty cheese and dairy specialties, and deliciously fresh fish in every restaurant. Another local specialty is dried octopus – a signature dish for Antiparos – or rabbit stew. Some taverns serve locally grown wine with the food. Antiparos has gently undulating hills with white chapels and small churches scattered around the sparse Cycladic landscape. The view from Antiparos includes Paros, of course, but also various other islands, some small and uninhabited, lounging in a picturesque group around Antiparos in the blue Aegean Sea. 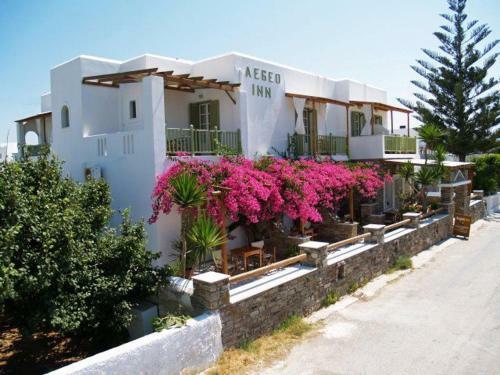 The island’s serene and tranquil atmosphere and the hospitality of the islanders have made Antiparos a favourite with tourists in recent years; hopefully the Cycladic island’s growing popularity won’t result in a building boom. The capital or Chora of the small island of Antiparos is located where the two islands of Paros and Antiparos are so close to each other that they almost touch; the ferry crossing from Pounda on Paros to Antiparos only takes a few minutes. Antiparos Chora is a little gem, a picture postcard village. The narrow lanes are well-kept and pretty, and the locals are proud of their independence from the big, touristy sister island. But the authentic charm of Antiparos is no longer a secret, either. There have always been day-trippers who came to see the caves and stayed for a few hours; but now there are some nice accommodation options, and people want to stay. There are some private luxury villas as well, one of them owned by the American actor Tom Hanks and his wife whose family has Greek roots. Antiparos is easy to fall in love with, as it has not only beautifully restored historical buildings and a picturesque harbour, but also long sandy beaches. An insider hint before prices go up.